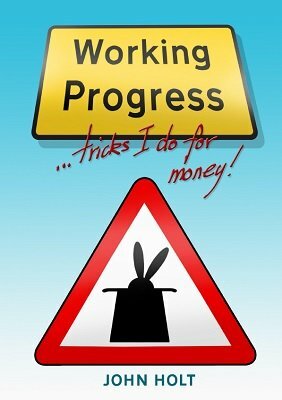 Working Progress is a short ebook of six tricks that I use when working for real, live human beings. They're all practical tricks that work in pretty much any performing environment you could possibly find yourself. Inside you'll find a cool transposition that you'll love to perform, a chop cup routine which includes TWO fabulous endings that get round the awkward "putting the lemons back into your pocket" reset moment, a great use for the Phil deck that you can use for parlour performances or to open a set at a house party, plus there's a routine for the card to wallet that doesn't foreshadow the ending. The Best (And Worst) One Handed Card Trick In The World - a transposition that uses misdirection to produce a "card under box" type of magical moment. Card To Wallet - a full presentation for the card to wallet that takes the heat of the wallet and stops the spectators from getting ahead of you. The Amazingly Fair Prediction - Despite shuffling, cutting and having plenty of chance to change her mind, the spectator's card somehow matches the magicians prediction perfectly....maybe. A Chop Cup Routine - A routine for the chop cup...but wait! There are two fabulous endings included so that you can leave the table clean, without having to just put the lemons back into your pocket! The Aldi Birthday Card Trick - A version of the Doc Eason "Happy Birthday Trick", where a special message appears on the back of a signed card, but without the setup. The Phil deck opener - A great presentation for the classic Phil deck/Card Shark Double Decker that is a great way to open a house party.